11/29/2012 | Blasphemous Obama painting goes viral | Last weekend we had Jamie Foxx say that Obama was our “lord and savior.” Now, we have the picture to prove it, or so we paraphrase former GOP candidate Herman Cain’s tweet which alludes to a new Obama painting which most find to be blasphemous. Most Christians find ‘The Truth’ blasphemous, while the painting is being widely circulated by liberals. LOS ANGELES, CA (Catholic Online) – References to Obama as the messiah are as old as his campaign, which almost acquired the status of a pop-cult back in 2008. 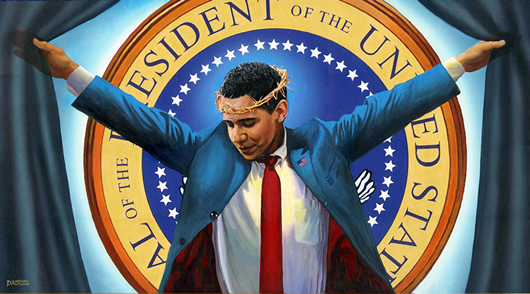 At that time, artist Michael D’Antuono painted a picture of Obama that depicted him as the Christ. Entitled “The Truth,” the painting shows Obama before the presidential seal wearing a blue suit, his arms outstretched to hold back curtains covering the seal. On his nodded head he wears a crown of thorns. The painting was scheduled for exhibition in New York four years ago, but public backlash dissuaded D’Antuono from proceeding. Now that Obama has been reelected, he has decided to stage the exhibit. D’Antuono claims the piece was intended to be political, rather than religious, based on the popular claims that Obama was some kind of savior to the American people. Despite the critical intent behind the artwork, many Christians still feel it is blasphemous. Now, the image of Obama as savior has gone viral on the internet with liberals forwarding the image for the purposes of gathering a rise from their Christian brethren on social networks. The image is becoming a leftist, atheist icon for Obama, regardless of the author’s intent. This cult-like following of Obama is nothing less than idolatry, but the controversy is great for dividing people and driving gallery admissions. Obama, who professes that he is a Christian, is still yet to comment against the artwork, and to repudiate Foxx’s weekend comments for that matter, leaving all to speculate that perhaps he does not condemn them much at all.